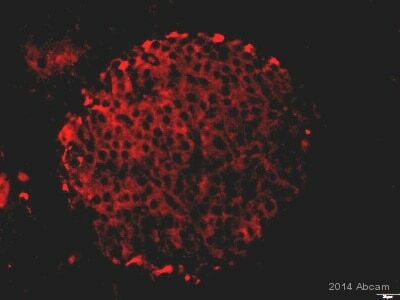 Rabbit polyclonal DLL4 antibody. Validated in WB, ELISA, IHC, ICC/IF and tested in Mouse, Human. Cited in 60 publication(s). Independently reviewed in 8 review(s). conjugated to KLH, corresponding to amino acids 121-134 of Human Delta4. Our Abpromise guarantee covers the use of ab7280 in the following tested applications. WB 1/500 - 1/2500. Detects a band of approximately 74 kDa (predicted molecular weight: 74 kDa). The levels of DLL4 in endogenous samples may be low. Abcam has not been successful in generating western blot data using endogenous samples, but can demonstrate the specificity using recombinant proteins and overexpressing cell lysates. Some customers have been successful using ab7280 for these samples - please see published references below. Plays a role in the Notch signaling pathway. Activates Notch-1 and Notch-4. The Delta-Serrate-Lag2 (DSL) domain is required for binding to the Notch receptor. Ubiquitinated by MIB (MIB1 or MIB2), leading to its endocytosis and subsequent degradation. This blot was produced under denaturing, reducing conditions. After transfer, the membrane was blocked for half an hour before being incubated overnight at 4°C with rabbit polyclonal to DLL4 (ab7280; diluted 1:1000). Antibody binding was detected using peroxidase labelled anti-rabbit antibody (diluted 1:40,000) for half an hour at room temperature and visualised using ECL development solution. IHC image of ab7280 staining in human kidney formalin fixed paraffin embedded tissue section, performed on a Leica BondTM system using the standard protocol F. The section was pre-treated using heat mediated antigen retrieval with sodium citrate buffer (pH6, epitope retrieval solution 1) for 20 mins. The section was then incubated with ab7280, 5µg/ml, for 15 mins at room temperature and detected using an HRP conjugated compact polymer system. DAB was used as the chromogen. The section was then counterstained with haematoxylin and mounted with DPX. ICC/IF image of ab7280 stained Hek293 cells. The cells were 4% PFA fixed (10 min) and then incubated in 1%BSA / 10% normal goat serum / 0.3M glycine in 0.1% PBS-Tween for 1h to permeabilise the cells and block non-specific protein-protein interactions. 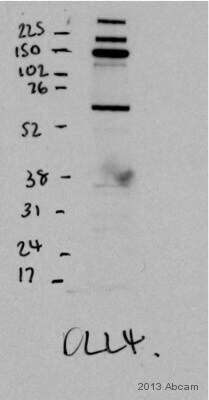 The cells were then incubated with the antibody (ab7280, 1µg/ml) overnight at +4°C. The secondary antibody (green) was Alexa Fluor® 488 goat anti-rabbit IgG (H+L) used at a 1/1000 dilution for 1h. Alexa Fluor® 594 WGA was used to label plasma membranes (red) at a 1/200 dilution for 1h. DAPI was used to stain the cell nuclei (blue) at a concentration of 1.43µM. Publishing research using ab7280? Please let us know so that we can cite the reference in this datasheet. Thank you for your suggestions, we will provide to perform other IHC with your suggestions. Thank you very much for your cooperation so far and sending me the additional information. I would like to suggest to either decrease the H2O2 percentage down to 0.3% and to incubate for 10 minutes, or to block the endogenous peroxidase after the primary antibody incubation to avoid possible epitope alteration. Please let me know if my tips improved the results. Pouvez -vous m'indiquer la concentration de Tween qui a été utilisé pour les immunoblots ? Par ailleurs, savez-vous si le lysat de pancréas de souris a été chauffé avant dépôt sur le gel de polyacrylamide? Je peux vous confirmer que 0.2% Tween a été utilisé pour les immunoblots et que le lysat de pancréas de souris a été chauffé avant dépôt sur le gel de polyacrylamide. Unfortunately it is not possible for us to sell the pre-immune serum of our rabbits. I am sorry that on this occasion I could not be of more help. 1. Try using 5% skim milk for blocking. 2. Try using 5% BSA for dilution buffer. 3. Try using a 12.5 % gel. Is the result as before: a strong band at the expected molecular weight of DLL4, and another smaller band at 72 kDa? Can you tell me if the customer has tried any other DLL4 antibodies with these samples? Also, have they considered isolating a membrane fraction from the cell lysate? That would enrich mature DLL4 in the sample and might eliminate the 72 kDa band, if it is not a membrane-bound protein like DLL4. I would like to purchase the antibodies (anti-Notch - ab79972 and anti-Dll-4 - ab7280), but I have one doubt. I would not able to find the shipping temperature data sheet (I notice just the temperature of storage). I was wondering if you can sent me this information for those antibodies before my purchase. Both of these antibodies are shipped at 4C on blue ice packs. They are both in stock, so if you order today by 8pm within the US, you will receive them by 10am tomorrow. I am sorry these products did not perform as stated on the datasheet and for the inconvenience this has caused. As requested, I have issued a free of charge replacement with the order number 123456. We have ordered these two antibodies on april directly from abcam. I'm looking forward to you replay. Thank you very much for your reply and your cooperation so far. I have found your order for these two products, and would be happy to send you a replacement. Please let me know which products you have chosen from our catalog.